Far too many construction sites lack the mulch and grass needed to prevent sediment pollution. Perimeter controls, like the overflowing silt fence here, cannot prevent pollution. Please take a moment to sign the Exposed Soil = Pollution petition. Exposed soil on a construction site usually means two things. First, a nearby waterway will be polluted come the next big storm. Second, you’re likely witnessing a violation of erosion and sediment control laws. Unfortunately, only a small fraction of sites minimize pollution by fully complying with the law. But we have a strategy to bring a halt to this form of pollution. This effort will only succeed with your help. And all that’s required is for you to spread the word that Exposed Soil = Pollution. 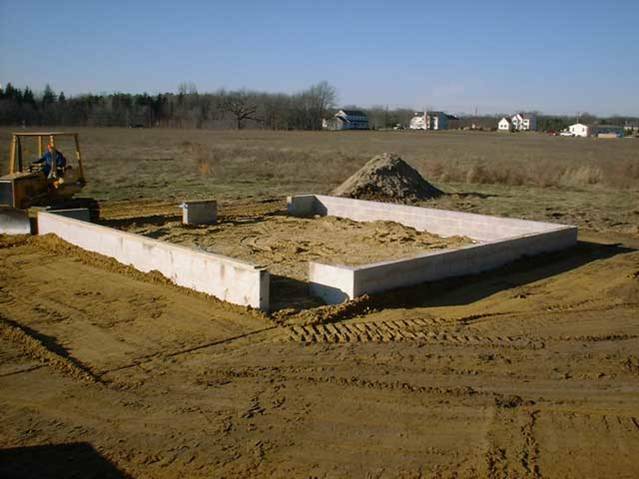 Most states require protection of exposed soils within 3- to 30-days of the date when vegetation is first cleared. 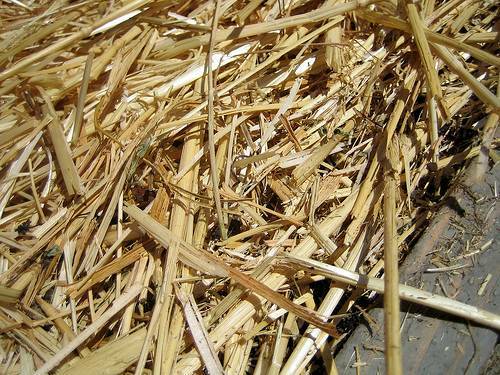 Usually, protection takes the form of a layer of straw mulch thick enough so underlying soil can’t be seen. If you can still see soil then raindrops can reach the soil and cause erosion. If an area is to remain idle for more than a few weeks then establishment of grass is also required. 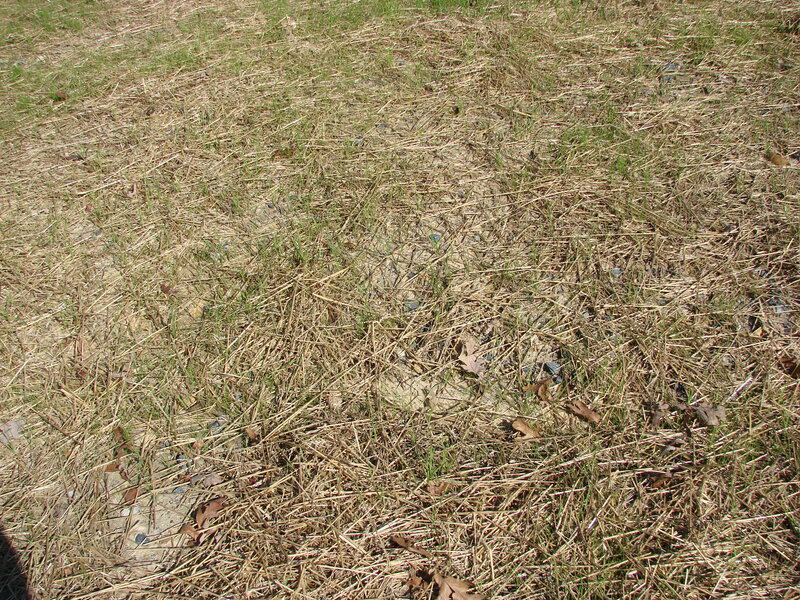 During the growing season (March-October) a 70% – 95% grass cover should be present within four- to six-weeks of seeding. If not, then additional treatments are needed until a thick grass cover is established. Additional mulch applications are required as soil is exposed due to wind and decay. Most contractors budget for only one mulching-seeding during the life of a construction site. If you’re lucky this single treatment results in a dense cover of grass throughout the site and your favorite waterway benefits from highly-effective pollution control. But most single treatments result in the Poor Stabilization/High Pollution pictured above. This is why so many sites are releasing excessive sediment pollution. By preventing erosion, mulching and grass can reduce offsite pollution by up to 99%. 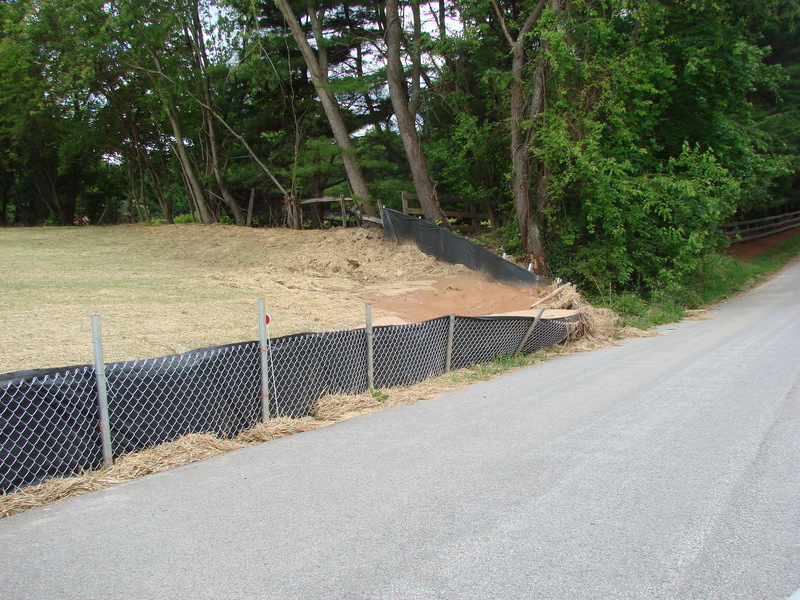 Conventional controls, like the black silt fence pictured to the left, trap substantially less. Without effective control a single construction site can damage three miles of downstream waters with recovery taking up to a century. Each dollar spent keeping mud on the site prevents at least $100 in downstream damages. To protect sensitive aquatic communities and our uses of these waters it is vital that all construction sites comply with the law by protecting exposed soil with mulch and grass. So, whenever you see Exposed Soil think pollution, then act. If you’re concerned that solving construction site pollution requires unpleasant confrontations or making enemies, then rest assured this simply isn’t true. The CEDS Equitable Solutions approach gets half the problems we pursue corrected through a cooperative relationship with the responsible party (aka polluter). A word to elected officials or enforcement agencies gets most other problem sites corrected, especially if the party ignored your friendly request. 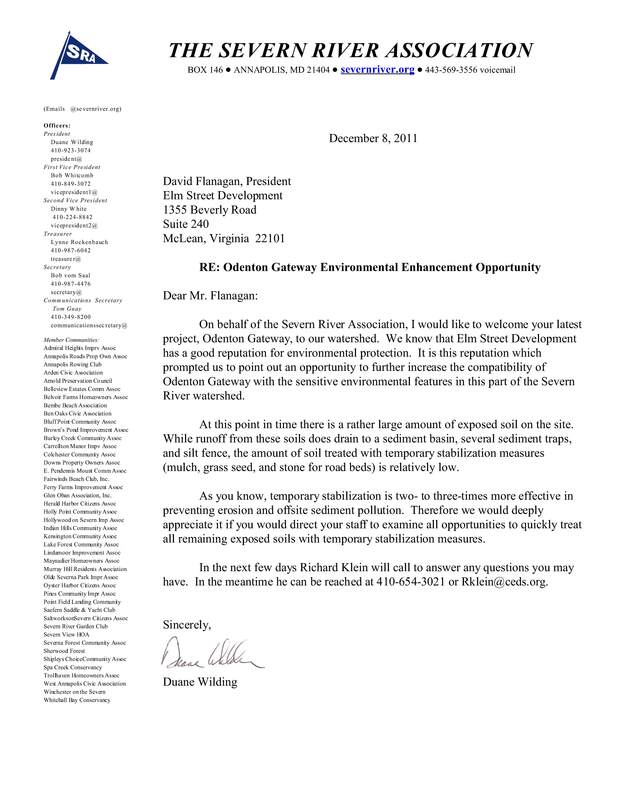 For example, on December 5, 2011 a local watershed group wrote the friendly letter to the left asking the developer for better protection of downstream waters. These photos show what the site looked like on December 5th then nine days later, after the developer had mulched and seeded the entire area. Had the group not sent the letter the site would have continued eroding for weeks or months. Further detail, including how to get poorly stabilized sites corrected quickly, will be found on the CEDS Exposed Soil = Pollution webpage. 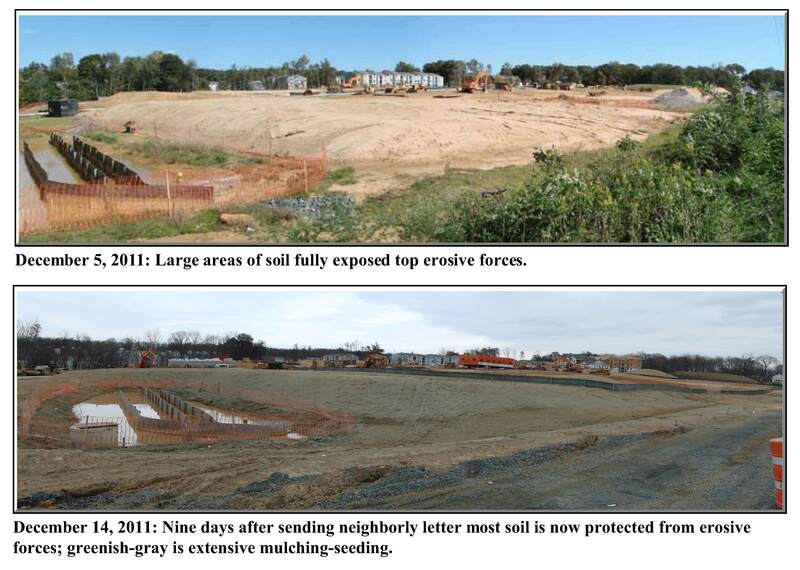 There you can download our free 18-page citizens guide: Exposed Soil = Pollution: How You Can Save 100 Feet of Chesapeake Bay Tributaries in an Hour by Halting Construction Site Mud Pollution. Though the title says Chesapeake Bay the procedures work in many other states. Most states require that stabilization occur within 3- to 30-days of initial clearance. The 3- to 30-day window allows the contractor to move earth about with equipment like the bulldozer to the left. The purpose is to fill and cut the site so road and building construction can begin. Of course it makes no sense to mulch soil today if it will be buried tomorrow through additional grading. Again, rough grade should be reached within a maximum of 30 days, while some states allow only 7 days. Some unscrupulous contractors will play the game of keeping a piece of equipment onsite and run it around occasionally to claim that rough grade has yet to be reached. 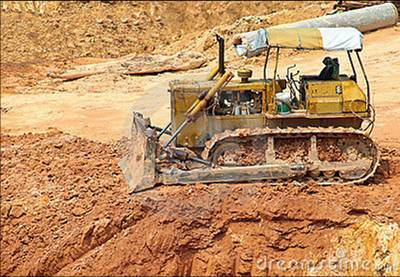 How can you tell if this Bulldozer Bluff is going on? Well, once building foundations are present or stone has been laid down on road beds then rough grade has been reached and ALL exposed soil must be mulched (outside the growing season) or mulched and seeded during the growing season. When wind or decay reduces mulch to the point where soil shows through then a new layer must be applied. 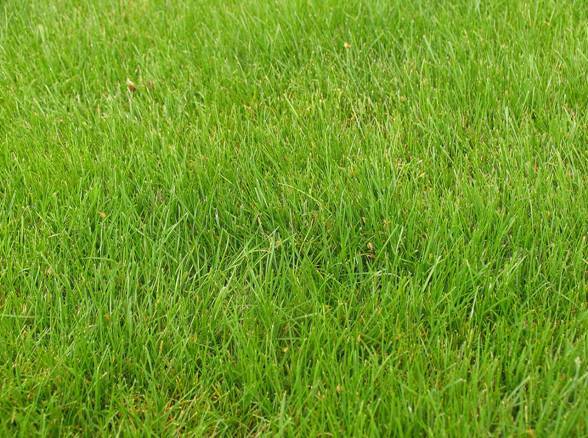 If a thick grass cover isn’t achieved within 4- to 6-weeks then an additional treatment is needed. In most places you’ll see lots of exposed soil on construction sites even though they reached rough grade weeks or months ago. Poor compliance is most likely where citizen support for enforcement agencies has been ineffective or nonexistent. Without this support staffing can decline to the point where minimum biweekly inspections are no longer possible. Also, it is far too easy for prodevelopment interests to pressure enforcement agencies into relaxing their standards when citizen oversight is lacking. For reasons we find baffling, few watershed groups provide this oversight and support despite the fact its the quickest, least costly way of improving water quality. If we educate our fellow watershed residents that Exposed Soil = Pollution then we can make poorly stabilized construction sites as taboo as burning leaves in the backyard or leaving pet waste on your neighbors lawn. It is incredible what can be accomplished through public education combined with a bit of social taboo. Consider residential recycling. In those parts of the country where neighborhood recycling has been effectively publicized, we see participation rates from 60% to 90%. In fact I’ve heard my neighbors gossiping about other community residents who never seem to put anything out on recycling day. I believe the same can be accomplished with regard to exposed construction site soil. In other words, as more and more watershed residents begin wondering why a construction site lacks mulch or grass, indirect and direct pressure on the developer will increase. Before long, full compliance may become as common as curbside containers on recycling day. So, whenever you have an opportunity to reach out to residents of your watershed, please include the Exposed Soil = Pollution message and ask them to participate in the following survey. If this is a repeat visit then how long ago did you last email us a photo? Let us know whether stabilization has improved. Guidance on how to obtain this information will be found in: Exposed Soil = Pollution: How You Can Save 100 Feet of Chesapeake Bay Tributaries in an Hour by Halting Construction Site Mud Pollution. We plan to use your information to create a database of localities with good stabilization and not so good. This will then allow advocacy groups to provide the not so effective local enforcement agencies with the public support needed to improve pollution control. Your name will not appear in the database. We’ll send you occasional updates, via email. Need a bumper sticker with Exposed Soil = Pollution.